As another year draws to a close I'm drawing a line underneath it. Turning a fresh, clean, page of an unwritten book and beginning, in media res, once more. 2014 wasn't bad, in fact there were a lot of positives, but towards the end I felt myself get a bit lost and carried away with the momentum. Without trying to sound too overly romantic or dramatic, I feel a bit wayward with who I am, what I want, and where I need to be, and feel like I have compensated for this unidentified feeling of late in material things, working too much for so little, and so on. I've neglected my lovely little blog, neglected my health, begun to push aside the people who mean the most and pretended so many times that I'm ok. Ok isn't good enough. In fact it's worse than being just fine. It's not happy, incredible or brilliant. It's just ok. I'm just ok.
My little head has finally realised that I deserve to be more than ok, that I don't have to work so many hours, and that taking time out is a good thing. So 2015, I'm coming for you...for me. I don't owe anything to anybody (well apart from the bank! ), certainly not my workplace, and certainly the world does not owe anything to me. 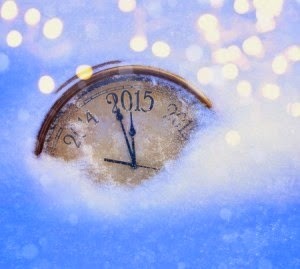 But I'm going into this new year in a resettled frame of mind, and wow, let's make it a good one...! I've just finished compelling my bucket list, as I do year on year, and you can have a read though it above if you'd like and see if we have any of the same goals/hopes/wishes. Just click on '215 Things For 2015'. #Blogmas Day Six: What's In My Work Bag?